Growing up in Manchester England, Ben spent weekends playing lacrosse, riding bikes (through the rain) and playing hide and seek in old Victorian houses. A fairly ordinary boyhood life – except that he loved design even back then. He loved sitting in ‘the good room’ on that amazing classic cream sofa, climbing on the Guy Rogers teak armchair, he loved the way his dining table extended so effortlessly so more friends could eat at the table. He loved his home and the possessions in it that made it his home. It was the beginning of his lifelong love of well designed and made furniture. 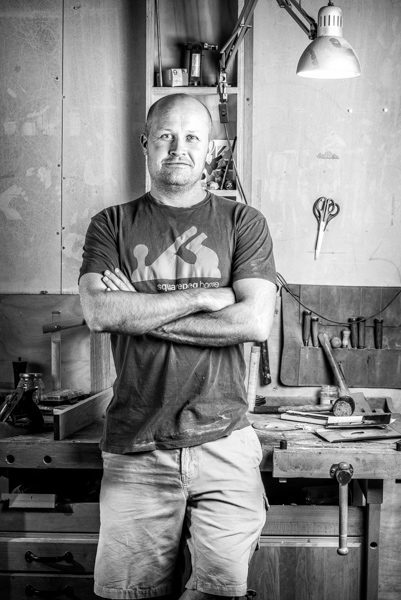 When Ben moved to Australia in the mid-1990’s working as a geologist, he spent his weekends off “in the shed” feeding his passion to create furniture that was both practical and unique. Eventually he decided to follow his heart and explore his lifelong love of making furniture. He attended the Australian School of Fine Wood to expand his wood-working skills and provide the foundation for building his own business. And he has never looked back. Ben lives and works in Fremantle, Western Australia. You can catch him there in his workshop at squarepeg home…or early mornings down at south beach.